Firefox version 29 has had a nice make-over, but one thing that has greatly annoyed many users is that not only has the Tab bar been moved to the top above the Address bar, but that when going into Customize, there is no longer an option to move it back to where you want. While you can install the Classic Theme Restorer Add-on to do this, you will still need to fidget with its settings to move the Tab bar, and it will revert to the old-style square tabs instead of the nice new rounded ones. But rather than install yet another add-on, which you then have to figure out how to use, and then loose the rounded corners on tabs, you can actually hack one of Firefox‘s config files – userChrome.css – to get your Tab bar to go back to the bottom. Once you’ve saved and closed the file, go to File > Restart, and when Firefox reloads, the Tab bar will be below the Address bar, not above it. While there are ways to change the default web browser via a GUI, this command-line method is even quicker. Also, while your email program and other apps might know which browser to open URLs with, you might find that Apport – Ubuntu‘s bug reporting system – looks to another browser you have installed. This is especially true if the other browser was at one point the default, and most notably this happens with Opera, though could also happen with Chromium/Google Chrome, Firefox, or any other browser you’ve installed before. While Apport generally carries on with the bug reporting silently once you’ve clicked to continue, occasionally it require you to log into Launchpad, and will fire up the wrong browser, quite often it being Opera. … and do the same there. That’s it – you’ll no longer have Apport or any other app open the wrong browser again. That’s it – the next time you open Chromium/Google Chrome, kwallet will no longer appear to annoy you. If you’ve been getting blue faces when watching YouTube clips, or any other Adobe Flash videos, the cause can be hard to pinpoint. When faces and flames, and other red/orange elements, turn varying shades of blue, it can be due to a buggy Flash update (especially for 64-bit users), or it can be due to video card driver issues (currently it seems to be affects a few Nvidia users after upgrading to Ubuntu 12.04 – read more at the bottom). Whatever the cause, this issue usually drives people to uninstall Flash, then reinstall an earlier version. Close the file, and confirm you want to save the changes. Now, all you need to do is restart your browser and your clips should look fine. If not, you may need to reboot, and hopefully all is fine when you return. … and set EnableLinuxHWVideoDecode= to 0 if you prefer to keep it. Nvidia users: Apparently the issue (which Adobe reportedly won’t be fixing) is caused by having hardware acceleration enabled, so right-clicking a Flash video, choosing Settings… and disabling “Enable hardware acceleration” can often fix this. However, the above fix is perhaps more elegant since you’re allowing Flash to use vdpau hardware acceleration, rather than just disabling it altogether. If you’ve set up Indicator Applet to include Mozilla Thunderbird, you may have noticed that the notifications are somewhat limited compared to what you get for the default email client, Evolution. But by installing a Thunderbird add-on and a small package, you can get a green envelope notification for newly received mail in the Indicator Applet, as well as a “black bubble” pop-up notification that blends in with the rest of your Gnome desktop. In Thunderbird, go to Tools > Add-ons, click the Install button, locate/select the file you downloaded, and click OK.
Once installed, you’ll get the familiar “black bubbles” popups for incoming mail. Bonus: Also works with other distros like Arch. Limitation: Only works with your Inbox; if you filter your incoming email into different folders, you won’t be informed when new (filtered) email arrives. The Search bar in Firefox – which many still look at as the “Google bar”, even though it lists other search engines – is extremely useful, but you can make it even more so by adding all sorts of search options. What we’ll look at here is the “Search Ubuntu packages” add-on, which (as the name suggests) lets you hunt for software for Ubuntu directly from the Search bar. All you have to do is go to the download page and click the Add to Firefox button, restart Firefox, and it’s done. 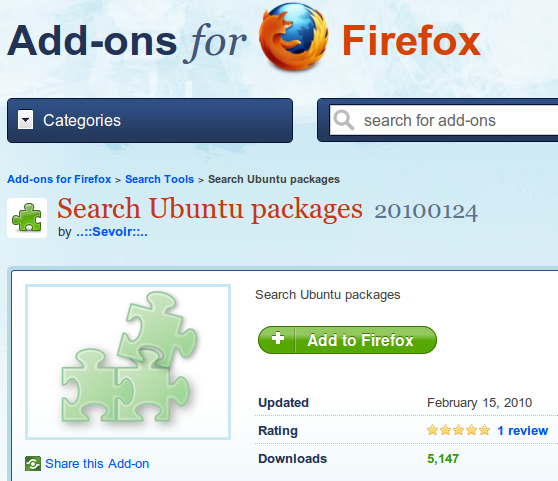 Alternatively, if you’re browsing the Firefox Add-on index you can just click the Add to Firefox button next to “Search Ubuntu packages“, and confirm by clicking Add. Once you restart Firefox, your new search option will be in the Search bar’s drop-down menu. When wanting to search for software, select Ubuntu packages, type the name of the program or package, and hit Enter. Like all new additions to the Search menu, it will appear at the bottom, so if you’d like to move closer to the top, click Manage Search Engines… (at the bottom of that menu) and move it where you want with the up arrow. Note that once you’ve used it, it will stay as the default search option till you choose another (so make sure you choose Google or whatever before doing a regular web search).